As an interfaith organization, we draw upon the powerful teachings of our faith traditions to love our neighbor, welcome the stranger and work for justice. These teachings represent the best of humanity, and it is from here that we evaluate the current proposals and move forward in the campaign for humane and just immigration reform. 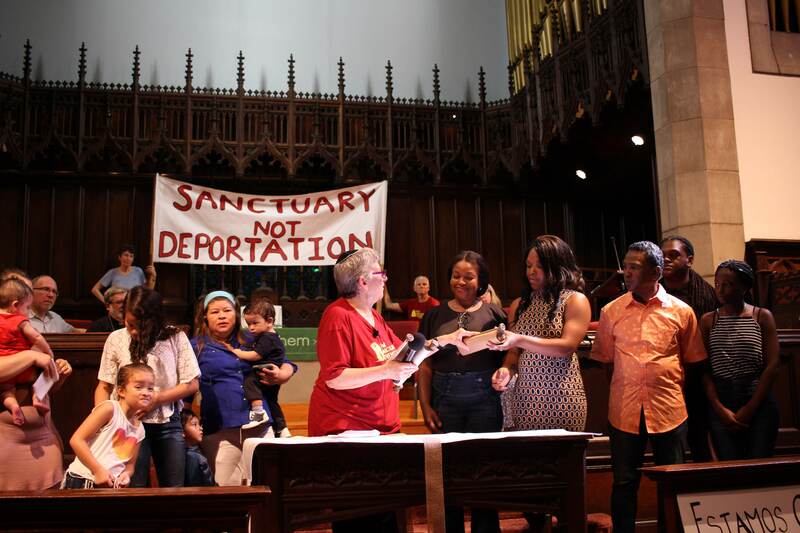 We are encouraged by the bi-partisan effort to take up comprehensive immigration reform(CIR) in Congress, and celebrate this step as a victory of years of organizing by groups here in Philadelphia and across the country. We support the pathway to citizenship for the 11 million undocumented immigrants in the US today, but CIR must provide a clear path to citizenship without insurmountable barriers (language requirements, background checks and fines) that make it impossible to become citizens. We reject trigger mechanisms, whereby a pathway to legal status for undocumented immigrants could only be opened after additional border security measures are put in place. Spending on border security, enforcement and incarceration of migrants has already increased massively. There is no need to wait for an enforcement trigger mechanism before establishing a pathway to citizenship for undocumented immigrants in our country. The militarization of the border does not mean greater security, only increased deaths at the border. We call for an end to unjust enforcement programs, such as Secure Communities. These programs terrorize immigrant communities, erode trust between immigrant communities and police departments and jeopardize public safety. We also call for the end of the detention system. Our government should prioritize spending on education, healthcare, dignified work and housing over spending on incarceration and enforcement. We believe these budget decisions are moral decisions. We call attention to the urgent need to address the long backlogs in the family-sponsored immigration system. It should not take 20 years for a US citizen to bring their Mom to the U.S. We need to make more visas available to speed up the process of family unification. And comprehensive immigration reform must protect the right of all couples and families – including LGBT – to stay together. We are concerned over the inclusion of a national E-Verify system. The current E-Verify system has been shown to be unreliable. Errors mean that millions of employment authorized immigrants could be denied work. E-Verify has proven ineffective, and enacting comprehensive immigration reform should not be contingent on expansion of a national E-Verify system. Any new worker visa program must provide for strict compliance with US labor standards and wage and hour standards, portability of visas so that workers can change jobs, and the ability for workers to petition for permanent residency. We call for an immediate end to deportations. Every day, the US deports over 1,000 people – causing severe trauma and emotional stress to individuals, families and communities. To be a welcoming and just country, we need to fully embrace our neighbors. We must begin to address the root causes of migration, such as destructive foreign and trade policies if we are going to have an honest conversation about immigration reform. We embrace our dignity and worth as human beings in one human family, which has built and continues to strengthen our communities. Therefore, we call for a comprehensive immigration reform that is inclusive of all people, regardless of gender, sexual orientation, age, education level, language, criminal history, economic status and immigration status.